If you’re a fan of Lego Cuusoo, the community driven Lego kit design workshop, you’ll probably love the idea of a site that lets you bring your own online creations into real life. Lego and Google teamed up to create a Web app called Lego Build that lets you virtually snap together your own Lego contraptions. Beyond their Web existence, your creations will actually appear in real life in Australia and New Zealand. When your start your Lego Build project, you pick out a plot of land you want your creation to appear on, and start building. Once you’re done, you can share your project on a public Google map and on Google+. 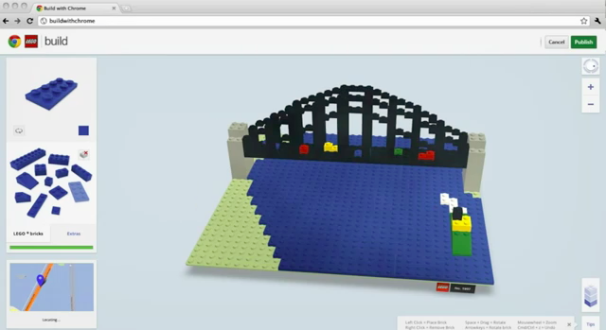 The joint project is in commemoration of the 50th anniversary of Lego in Australia. According to the Telegraph Australia, the Build project hopes to roll out globally later this year via Google Chrome.